Whenever an artist is interviewed, he or she speaks about “influencers,” those whose work not only inspired but also laid the groundwork for the artist’s own work. Bloggers may not realize or acknowledge it, but they have been influenced by Michel Eyquem de Montaigne, a noblemen, government official, and winegrower who lived in southwestern France from 1533 to 1592. 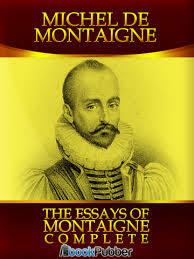 Why Montaigne? He was responsible for creating a new genre- the essay. The word, essayer, in French, can mean “attempts,” “exercises,” “trials,” or “experiments.” Montaigne’s “attempts” follow a logic of their own, sometimes unsystematic and disjointed, covering a wide range of unrelated topics and provocative subjects such as sadness, idleness, liars, fear, smell, prayer, cannibals, prayers, names, sleep, cruelty, books, conscience, glory, presumption, drunkenness, affection of fathers, and thumbs. He is at the top of my list for one of the early insightful voyeurs of life. As you and I know writing has multiple benefits. One of those is to better dig deeper into ourselves. You’ve done a nice summation of his work, which has “influenced” many.